MIAMI, April 15, 2008 â€“ In its latest evolution in cruise ship design, Royal Caribbean Internationalâ€™s Project Genesis will bring the best of the land to sea with Central Park, a revolutionary design in which the center of the ship opens to the sky and features lush, tropical grounds spanning the length of a football field. An exquisite public gathering place featuring serene pathways, seasonal flower gardens and canopy trees, Central Park will provide cruisers with more choices in a unique outdoor space. One of the shipâ€™s most ground-breaking spaces, this new concept is the first of seven neighborhoods to be unveiled on Project Genesis. Each neighborhood will provide vacationers with the opportunity to seek out relevant experiences in various locales based on their personal style, preference or mood. Elegant and lively, Central Parkâ€™s central piazza will be the shipâ€™s â€œtown squareâ€ which evolves from a tranquil and peaceful atmosphere during the day to a gathering space for alfresco dining and entertainment in the evening, where guests will enjoy concerts and street performances. The neighborhood is lined with balcony staterooms rising six decks high with views of the Park below and the sky above. Surrounding this social space will be an array of restaurants, with choices ranging from fine dining to casual chic. Guests will have the option of an elegant dinner at the new 150 Central Park or a picnic lunch from the more casual Central Park CafÃ©, where they can sit outdoors and people-watch. 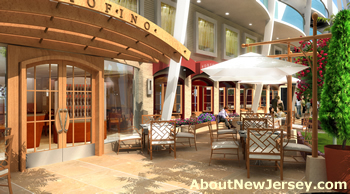 Other dining choices will include: Giovanniâ€™s Table, an Italian restaurant; Vintages wine bar; and Royal Caribbeanâ€™s signature Chops Grille steakhouse. Several bars will be scattered throughout the Park, including the Canopy Bar, located at one of two impressive glass-domed canopies, and the unique Rising Tide bar – the first moving bar at sea. Truly an engineering feat, Rising Tide will span three decks and allow cruisers to enjoy a cocktail as they slowly ascend into Central Park and then descend back into the public spaces below. Central Park also will have stylish boutique shops, showcasing a selection of upscale merchandise. â€¢ Central Park is located on Deck 8 of the ship, with dimensions of 62 feet (19 meters) wide and 328 feet (100 meters) long. 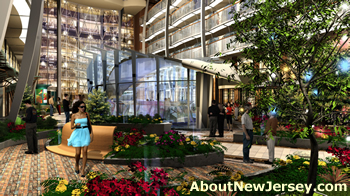 The sophisticated neighborhood will include 334 staterooms overlooking the Park, 254 with balconies. â€¢ Central Park will be landscaped with tropical foliage, including seasonal flowers, shrubs and trees. Drawing on the concept of unexpected surprises and intrigue, garden spaces throughout the Park will sprout from charming pathways. Drifts of Calla Lilies among Giant Elephant Ears, Red Ginger, Rabbit Foot Ferns and Zebra Calathea are some of the plant life guests will discover. Trees, some eventually reaching more than two-and-a-half decks tall, include Black Olive, Cuban Laurel, Cherry of the Rio Grande, and Painted and Golden Bamboo. â€¢ Surprises in the Park include quiet reading corners; a Chess Garden with large-scale pieces; the Pergola Garden, an interpretive garden featuring vegetation from a host of Caribbean locales; and a Sculpture garden, highlighting work by international artists. â€¢ Irrigation and drainage systems will be incorporated, along with micro-climate control techniques. â€¢ An on-site horticulturist will provide educational classes for guests seeking to learn more about flora. â€¢ The Crystal Canopies, two impressive arched-glass domes, one with a bar, will be a focal point of Central Park and provide sunlight into the shipâ€™s inner public spaces. o 150 Central Park â€“ The most exclusive dining venue on the ship, 150 Central Park combines leading-edge cuisine with leading-edge design. An observation window into the kitchen of this stylish restaurant will give Central Park passersby the opportunity to observe the executive chef in action. Open for dinner. o Chops Grille â€“ Continuing the tradition, Royal Caribbeanâ€™s popular signature steakhouse will offer premium cut, quality meats in an upscale, contemporary setting. Open for dinner. o Giovanniâ€™s Table â€“ Influenced by the Tuscan countryside, Giovanniâ€™s will be a casual new Italian restaurant concept offering toasted herbal breads, pizzas, salads, pastas, Italian sandwiches, braised meat dishes and stews. Rustic with a contemporary flair, dishes are served family style in an indoor and outdoor setting to provide an alfresco experience in Central Park. Open for lunch and dinner. o Central Park CafÃ© â€“ A casual dining choice providing a high level of variety and flexibility, Central Park CafÃ© is an indoor/outdoor gourmet market with walk-up counters. From freshly prepared salads and made-to-order sandwiches to paninis, crepes and hearty soups, guests order directly from the chefs behind the food stations. European pastries, sublime chocolates and decadent fudge round out the offerings. Open for breakfast, lunch, snacks, dinner and late night treats. o Vintages â€“ Always a popular hot spot for Royal Caribbean guests on Voyager- and Freedom-class ships, the Vintages wine bar evolves into a larger space on Project Genesis, offering a variety of options for those seeking a tropical white Riesling or a mocha-inflected Merlot. Great for a pre-dinner rendezvous, Vintages also provides a selection of cheeses and a full tapas menu to accompany a robust selection of fine wines. Open for lunch and dinner. â€¢ Central Park will feature upscale retail boutiques for discerning travelers, including specialty outlets such as The Parkside Gallery, showcasing original artwork for purchase, and Picture This, a portrait studio. 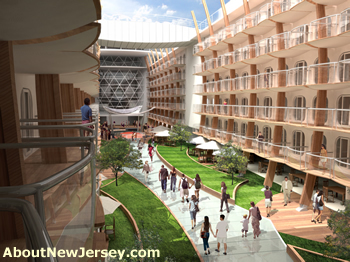 When she launches in late 2009, Project Genesis will be the largest and most revolutionary cruise ship in the world. An architectural marvel at sea, she will span 16 decks, encompass 220,000 GRT, carry 5,400 guests, and feature 2,700 staterooms. The ship will sail from her home port in Fort Lauderdale, Fla. In 2010, she will be joined by a sister ship. Additional information is available at www.royalcaribbeangenesis.com. Royal Caribbean International is a global cruise brand with 21 ships currently in service and two under construction. The line also offers unique cruisetour vacations in Alaska, Asia, Australia, Canada, Europe, South America and New Zealand. For additional information or to make reservations, call your travel agent, visit www.royalcaribbean.com or call (800) ROYAL-CARIBBEAN. For travel professionals, go to www.cruisingpower.com or call (800) 327-2056. Next articleKeep Our Beaches Clean! I can’t wait to see this ship, it looks like it will be total amazment just to be onboard.